OK, so you got a traffic ticket… Look, it happens to the best of us. But now you want to avoid getting the POINTS that the DMV issues for your moving violation so your insurance company does not jack you! 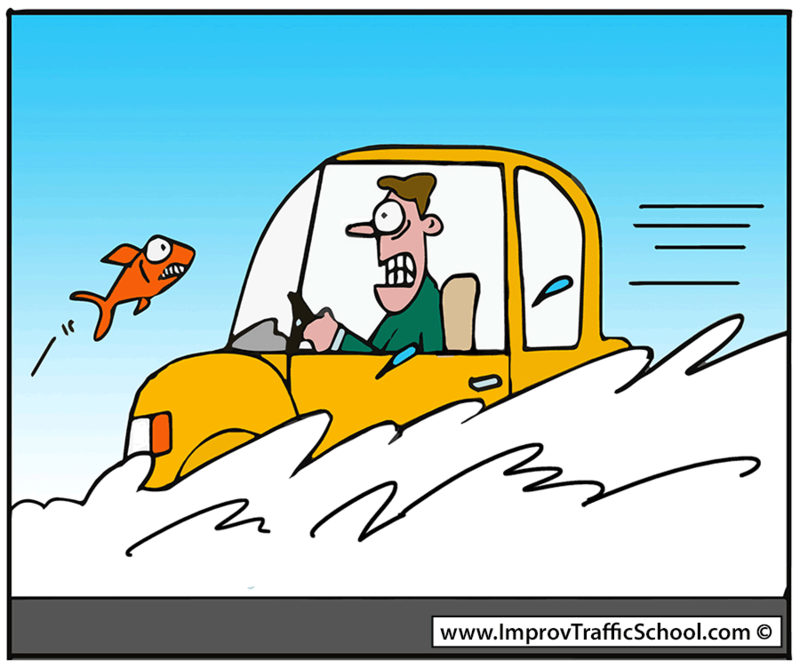 Driving Safety is our main mission here at The Improv Traffic School, but so is keeping your insurance costs lower… and we have been doing it for decades now. Most moving violations like speeding, running a red light, illegal U-turns and such carry points that can add up to a suspended license or even a revoked one. For instance, in California, if you rack up 4 Points in 12 months, 6 in 24 months or 8 in 36 months, you will get a nasty letter from the DMV saying “COME ON DOWN…YOU ARE THE NEXT CONTESTANT ON THE DMV HEARING OFFICER IS ALWAYS RIGHT! !” and then you have to explain WHY in the world they should let you out of their office with a valid drivers license in your wallet? Do you know what the chances of that are? Have you ever heard of the Law Firm of SLIM & NONE? There are actually attorneys you can hire to handle your hearing, and they have been specifically trained to get you a better outcome like perhaps a “restricted license”… driving to or from work, or during hours of employment or to and from school. OR… they might be able to get you a shorter suspension. Can YOU do this yourself? Perhaps if you understand that you have NO right to drive and do not approach your suspension hearing as if you did. We ALL have to drive to make our living really. Educate yourself online as to how to conduct yourself at a Suspension Hearing. For revocations… I highly suggest you do not handle this yourself. So… of course we suggest that you DO NOT BREAK THE LAW in the first place, but, as the saying goes… “compost happens“. Your “Good driver discount” with an insurance company CAN be at stake with even ONE point found against you, which is why our traffic school IS a solution. Always check with your own Insurance to see, and check with your State DMV by phone or website to check out what the policy is on points in YOUR state.